The 2016 Toyota Corolla is a top-seller in the United States, just behind big brother Camry. So it’s not surprising the compact sedan shows up among many car buyers’ shopping lists like Toyota lease specials. Leasing offers many advantages over buying a car. Payments are low from the monthly expense to repair costs. Even the sales tax is less since you only pay on the portion you finance. You can find this Corolla for sale near Shaumburg in Elmhurst. The staff at Elmhurst Toyota will be more than happy to discuss the details when you lease a Toyota Corolla from them. We’ve got 1000’s of satisfied car owners from all over Chicgoland. Why? Because we truly want you to be happy with your purchase or lease as well as one you can afford. There’s a lot to like about the Toyota Corolla. Still fresh from its redesign in 2014, the 2016 Corolla beats many competitor’s offerings with its spacious rear legroom and high resale value. Four main trim levels and two sub-trims mean there’s a Corolla for almost any budget. This is especially true with leasing, which allows buyers to get more car at a low monthly payment. Take a test drive in the high mileage-focused LE Eco with its specially-tuned, 35 mpg combined engine. Or check out the numerous exclusive chrome accents found on the sporty SE. A limited S Special Edition joins the lineup this year to celebrate the Corolla’s 50th anniversary. 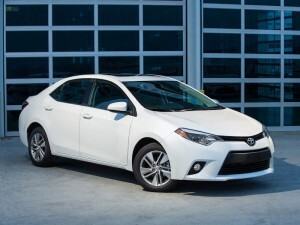 So take advantage of the numerous advantages of leasing your Corolla. We make financing easy here at Elmhurst Toyota. Our finance officers will happily offer expert advice on lease programs. You can trust them. They have access to many kinds of financial packages and options. You’ll quickly discover why our satisfied customers contact us first for their car leasing needs.